We charge based on how much of the truck you fill. You set the budget and we'll do the heavy lifting. Our Truck is 2X LARGER than the other guys! We can take up to 30 Cubic Yards! We charge based on how much of the truck you fill. Our drivers will load front to back and top to bottom. We take weight into consideration for heavy items such as concrete, construction debris, or dirt. The landfill charges all customers an extra fee to dispose of items that are difficult to dismantle or process. 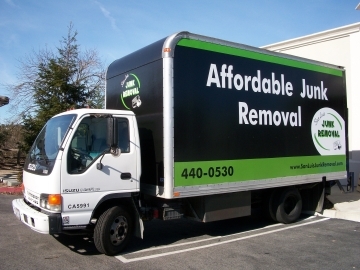 How does San Luis Movers and Junk Removal Determine their prices? One of the biggest costs associated with removing junk is the expense of disposal. San Luis Junk Removal recycles and donates whenever possible but a large portion of what we haul ends up in the landfill. Upon entering the landfill, we are charged by weight for the materials we drop off. We also have the added expense of sorting your junk into various categories for proper disposal. Part of our price reflects the maintenance, upkeep, and expense of our trucks. Trucks use fuel and require regular maintenance. Good help is hard to find. That’s why San Luis Junk Removal tries to find the most reliable and trustworthy employees it can. Part of our commitment to our employees and our community is to offer quality employment. San Luis Junk Removal starts all employees above the minimum wage required by law.